For the third year running, we have received a PE Grant from the Government to provide and motivate children to be involved in sporting activities. ‘Play Area’ – Circus skills, French Skipping, Egg and Spoons, etc. ‘Football’ – Two football pitches were marked out and goals and equipment purchased. We have found that children like all of the areas and have said that they are more active now. Feedback about the equipment from MSAs has been positive. They have said that children are more active and it has also had a positive impact on the children’s behaviour. The Specialist coaches we have employed through Norwich City Community Sports Foundation and Premier Sports have had an impact on both staff and children, particularly in Gymnastics, football and cricket. The children made good progress mad the teachers said it helped with their subject knowledge of the different sports. Children also thought that the coaches helped the teachers learn more about different sports and they were able to see the skills the coaches used. Our equipment is regularly checked for safety and replaced or repaired accordingly. We have attended more events this year than previously years and been successful at Cross Country and Tri Golf. Some children also had the opportunity to attend a Multi Skills Event at UEA, a rugby event, gymnastics and two football events, all of which were thoroughly enjoyed. We have also hosted two football matches against two other schools and won both matches. 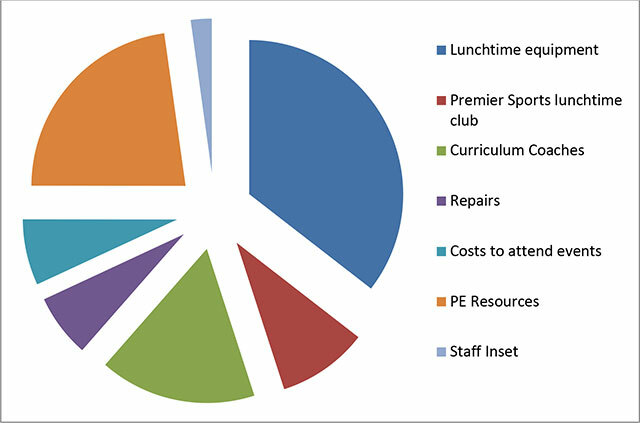 As our school is expanding, we need to purchase more resources to suit different children. We have also purchased resources so we can offer a rugby and Tri-Golf After School Club. A member of staff attended a PE Assessing Without Levels Course which will be feedback to the staff in the Autumn Term as a tool to assess progress in PE. We are continuing to look at providing different opportunities to motivate the children at Ashleigh to lead healthy, active lives. This year we have been able to run a Change for Life Club for a group of children. The children were asked about different aspects and attitudes to PE and healthy living at the beginning of the 10 weeks and again at the end to measure the impact of the club. We are pleased to report that children responded well and changes have been made to their lifestyle. At Ashleigh all children participate in Activate twice a day – first thing in the morning and after lunch time, which are led by our MSAs. Activate has been designed to help pupils become more agile, better balanced, better co-ordinated, better controlled and more precise in their movements. It also helps children develop their listening attention and concentration capabilities. Children enjoy participating in Activate and see it as part of their school day. See www.valsabinpublications.com/publications/activate for more information.